UNITED NATIONS, Apr 16 2014 (IPS) - Women’s empowerment and political participation are not only crucial for women: they are essential for effective democratic governance, one which promotes human rights and equity. The same can be said about the importance of boosting youth political participation. The U.N. Development Programme (UNDP) invited three young women parliamentarians from Latin America and the Caribbean to join a recent discussion in Salamanca, Spain, on young women’s political participation in the region. In the digital age of flourishing social media activism, these protests also provide opportunities to rethink democratic governance in the 21st century. That’s what Paola Pabón from Ecuador, Silvia Alejandrina Castro from El Salvador and Gabriela Montaño from Bolivia have in common. They are among the very few women in parliaments and they are young: They broke a double glass ceiling. Of the 600 million people in Latin America and the Caribbean, more than 26 percent are young, aged 15-29. This is a unique opportunity for the region’s development and for its present and future governance. Even though the average regional rate of women taking up positions in parliament is 25 percent, higher than the global average, a closer look shows that women still lag behind. Our recent survey of 25 parliaments in Latin America and the Caribbean shows a very low representation of youth in the region’s parliaments – especially those of African or indigenous descent. Only 2.7 percent of male parliamentarians in the region and 1.3 percent of women MPs were under 30 years old—even though more than one fourth of the region’s population is young. When we look at the age of MPs below under 40, 15 percent are men and not even 6.5 percent are women. UNDP’s regional Human Development Reports have shown that young people have enormous potential as agents of change. But despite Latin America’s remarkable progress in reducing poverty and inequality – and its strides toward strong democracies with free and transparent elections – gender, income, ethnic origin, or dwelling conditions are all decisive barriers to young citizens’ rights and civic engagement. One in every four young people aged 15-29 in the region are poor or extremely poor. And only 35 percent of them have access to education. More worrying still: Some 20 million young Latin Americans aged 15-18 neither work nor study. That’s nearly one in every five, 54 percent of them female and 46 percent male. And the region’s youth have been taking to the streets, playing a central role in recent protests in countries like Brazil, Chile, Peru and Mexico. Such demonstrations urge us to understand the demands of young people, and to address lingering structural problems in our societies, especially inequality. The increasing frequency of such mobilisations tells us that young people want to actively participate in their society’s development. The first Ibero-American Youth Survey – which we launched last year with the Ibero-American Youth Organization (OIJ) and other partners — shows that young people in Latin America, Portugal and Spain expect their participation to increase over the next five years. Institutions should provide formal spaces for this, or protests will become the only effective way for young people to make their voices heard. And the region will waste an opportunity to enhance the quality of its democratic governance. We are working towards this goal. UNDP and partners brought together 22 young MPs from 13 countries in Latin America and the Caribbean in 2013 to put together the region’s first young legislators’ network to boost young people’s political participation and inclusion. We have been partnering with OIJ and other U.N. sister agencies and governmental youth secretaries to push this agenda. Moreover, our youth online platform JuventudconVoz (youth voices), with the OIJ and the Spanish Cooperation agency, is also helping boost young Latin Americans political participation and leadership skills. 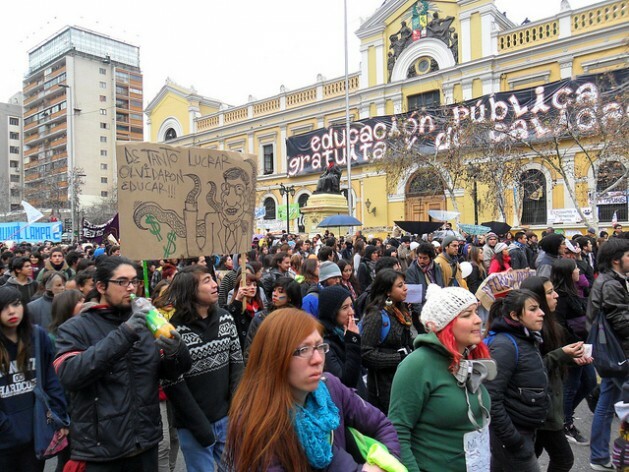 Protests sparked by young Latin Americans will likely continue in several countries. Beyond the street level, in the digital age of flourishing social media activism, these protests also provide opportunities to rethink democratic governance in the 21st century.